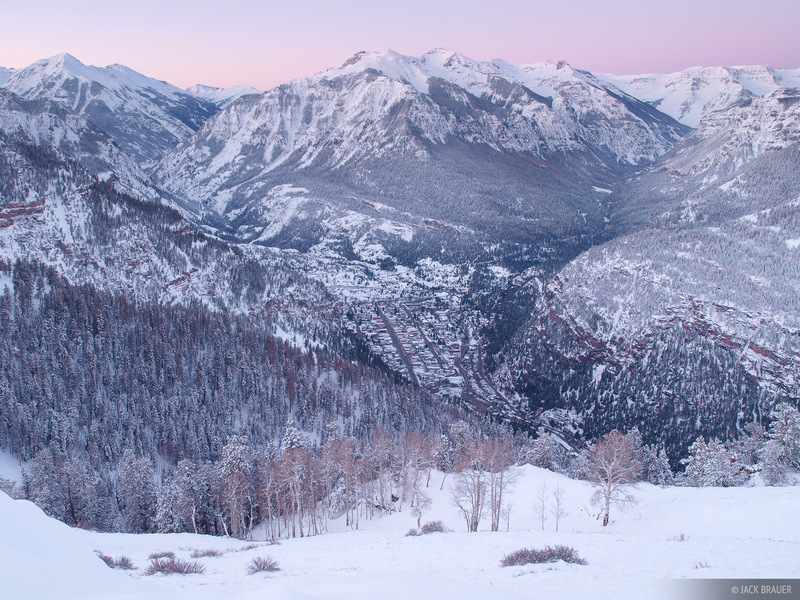 Over the last few days, a late season storm has come through the San Juans in Colorado, dumping almost 2 feet of snow. On Sunday, while still snowing hard outside the weather forecast called for a sunny clear Monday, so I headed out for a spur-of-the-moment winter backpacking trip, hoping to get a photo of the fresh snow smothering Ouray and the Uncompahgre Gorge. I hiked up to the Bridge of Heaven, a high ridgeline 2600 feet above Ouray, set up my tent in the blizzard, and woke up to clear dawn skies. Despite sacrificing two good snowboarding days to do this trip, I was satisfied to get the shots I have been envisioning for several years. 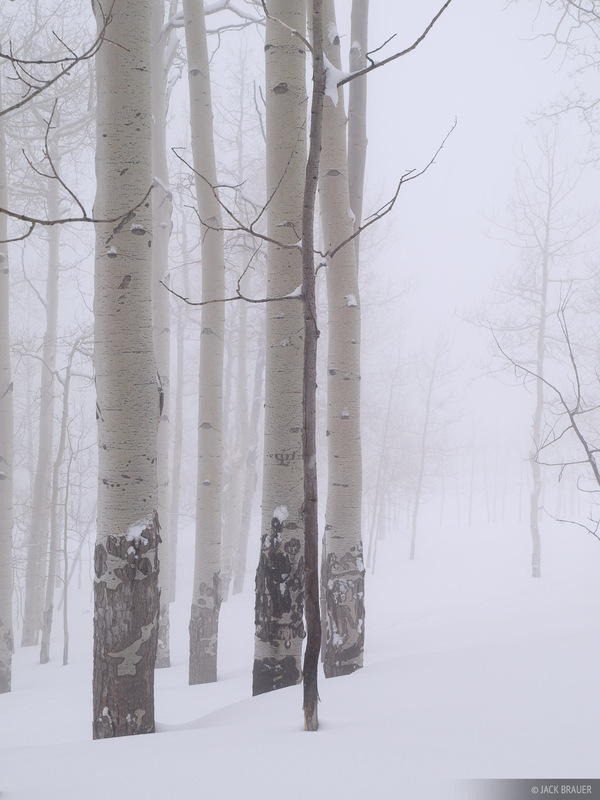 The aspens looked mysterious in the foggy blizzard. Photo © copyright by Jack Brauer. My MSR Twin Sisters winter tent glows from within, in the middle of the night high on the Bridge of Heaven above Ouray, Colorado. Storm clouds blow away from the San Juans in the background. Photo © copyright by Jack Brauer. 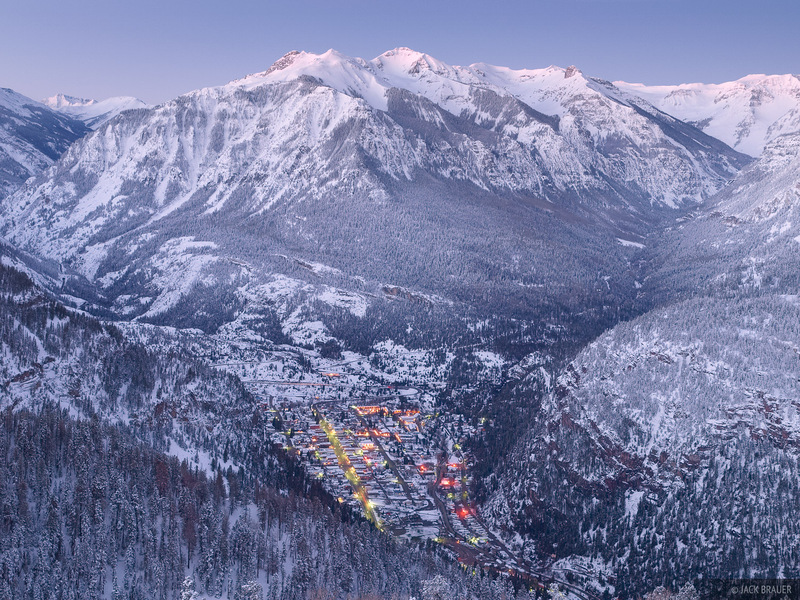 Hayden Mountain illuminated by dawn glow, with the city lights of Ouray down below on a snowy April morning. Photo © copyright by Jack Brauer. Sunrise glow in the rugged and snowy San Juan Mountains, with the town of Ouray nestled down below, as seen from the Bridge of Heaven, April. Photo © copyright by Jack Brauer. 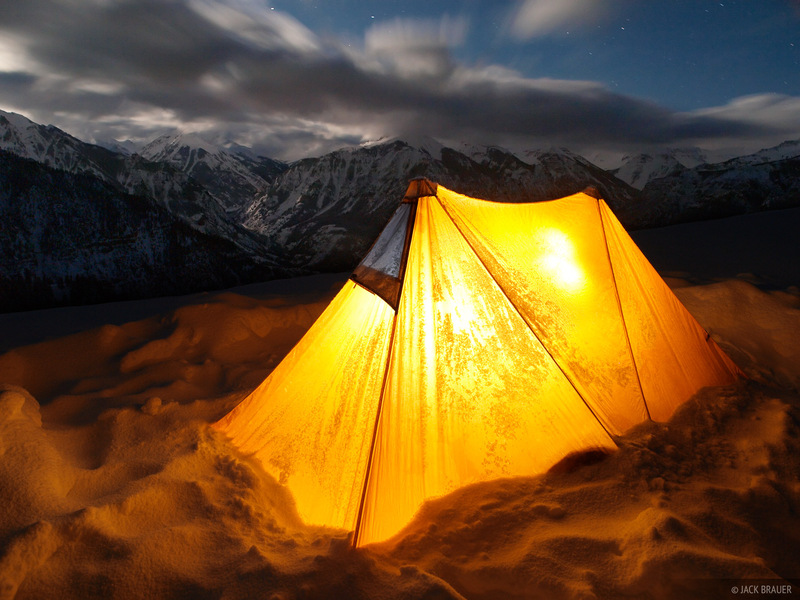 Posted in Backpacking & Trekking, Colorado and tagged San Juan Mountains, Ouray, Colorado, Winter Camping.